In most industries, the business environment remains brutal; growth is slow or non-existent and price competition rampant. The question on the minds of many business executives is simple: How can I increase profits and grow when all my customers care about is low price, low price and low price? Of course, there is no easy answer to that question. If there were, the airline industry would not have a 20-year-plus record of destroying corporate value. Still, there are steps you can take to combat this epidemic of price competition. The prime reason that companies are stuck in brutal price competition is that customers do not perceive any difference among their competing suppliers’ products and services. With everything the same, all competitors are just competing “to be the best” by offering the best price, best service, etc. Long-term, such competition is hugely destructive, but short-term it might be the reality. To deal with it, perform with good quality, good service, and good customer relations. The dirty little secret is that in many—if not most—industries doing what you say and performing will differentiate you immediately. Especially in the business-to-business world, a quick test to see whether you are performing better than the competition is whether you are getting the last look from customers and the opportunity to accept or reject the work. Many customers will reserve last look for their favored suppliers, owing to performance or relationships. If you are not getting the last look, how you can improve your relations with your customers to get that last look for nearly all work? Performing well will only get you so far. To escape the underworld of price competition, you must differentiate your products and services in order to create unique value that your customers want and are willing to pay a good price for. The first step in differentiation is to identify the products and markets where you already are differentiated. Look at all your product lines and markets and find those areas where the margins are the highest and the price pressures the lowest. What is it about that part of the business that makes it different from the others in the low price arena? Is it your relationship with the customer? Is it in a different market niche? Are you offering a unique product or service to these customers? Is this part of the business growing? Once you have answered these questions, your focus should be to mimic the differentiable features in your other business or to focus on getting more work on that “better” part of the business. The next step is strategy. What can you do with your customer base and/or your product and services offering to make something unique, something valued, and something not easily copied? Can you create new value with a truly unique and distinctive offering? Can you offer additional follow-on items or services that customers value but that are not as price sensitive? Think of the company that performs routine maintenance on a complex product that offers re-sale and upgrade items or follow-on services at a good (not larcenous) price. How else can you improve the customer’s experience of using your products? What other complementary markets would it make sense to enter? Other industries or markets to which your suppliers sell? Other industries that companies in the chain of purchasing sell to? In finding a way to differentiate, avoid adding features or services that are easily copied and just raise the cost of doing business for all competitors with the increased value going to the customers and suppliers. The perfect example of this is the airline industry where many new innovations—frequent flyer miles, business and first-class upgrades—did not differentiate the airlines involved. Instead, all the value and benefits accrued to the flying public. To paraphrase business strategist Michael Porter, competition within an industry is not just among competitors, it is also a tug of war over value between a company, its customers, and its suppliers. Sometimes, at the end of the day, the answer is that there are few opportunities to grow rapidly with your strategy and do it profitably. You’ve got a strong position in your space, and no good way to expand it significantly. Here, the huge mistake is to deny that reality and to try to turn lead into gold. Instead, you should simply make a good ROIC (return on invested capital), pay good dividends or otherwise return capital, and enjoy creating value and wealth. The second choice is to exit or sell the business. All too often, continuing to work hard in a permanently depressed and ultra-competitive business is like beating your head against the wall. It only feels good when you stop! David M. Shedd heads Winning B2B Leadership, an advisory firm serving small to middle-market companies in the concrete products and other manufacturing industries. His experience includes 10-plus years in executive positions with a major precast concrete producer. He is the author of Build a Better B2B Business and maintains a blog at www.helpingleaderswin.com. He can be reached by e-mail at [email protected]t, or by phone at 480/734-0569. 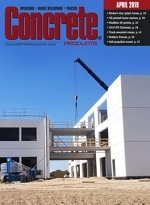 This is the fifth in a series of columns addressing leadership and business success for the concrete products executive.